Important! Improve the text of the meta description. Important! The page title should fit better to the content of the page. The page title should be shorter than 580 pixels. It is currently 603 pixels long. Urlaub weltweit: Hotels, Ferienwohnungen und Ferienhäuser für Reisen und Urlaub an Nordsee und Ostsee, in Holland, Frankreich, Italien, Spanien, Kroatien, Dänemark uvm. The meta description should be shorter than 1000 pixels. It is currently 1031 pixels long. description Urlaub weltweit: Hotels, Ferienwohnungen und Ferienhäuser für Reisen und Urlaub an Nordsee und Ostsee, in Holland, Frankreich, Italien, Spanien, Kroatien, Dänemark uvm. 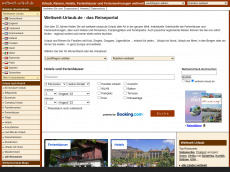 Test up to 1.000 webpages of weltweit-urlaub.de with our free plan! This page contains 1181 words. That's ok.
8.7% of the text are stop words. 4 paragraphs were found on this page. The average number of words per sentence of 14.11 words is good. A viewport "width=device-width, initial-scale=1.0" is provided. The usage of strong and bold tags is perfect. We recommend the use of up to 24 tags for this page. There are 1 external links on this page. This website redirects to "https://www.weltweit-urlaub.de/"
The page response time is excellent with 0.21 seconds. This website only loads 1 CSS files. That's ok. The file size of the HTML document is fine (88 kB). Shallalist classifies this website as Recreation/travel. This classification is fine. This website is referenced by wikipedia. This website has backlinks from 1,167 referring domains. This website has 15,721 backlinks. This website has backlinks from 747 different ip addresses.